Ah, the great social media debate rages on – some of you may think that it’s nearly impossible to garner sale qualified leads from social media, while others realize the immense benefits your business can receive from growing your social platforms. I’ll let you in on an SEO secret. There is a method to all this social media madness, and it has two components: a rock solid strategy & time. If you’re thinking with an SEO mindset when creating content, then you’re already one step ahead. It’s important to note that building your social media platforms is much more than just setting up a profile and letting it ride, we’ll get into the specifics later, for now let’s take a look back to 2015 and discuss the changes that boosted the SEO significance for social media platforms like Houzz and Pinterest. Google rolled out important changes and tweaked their algorithm in 2015. The biggest and most broadcasted was the Mobile Update, AKA “Mobilegeddon” that took place in April 2015. It’s no surprise that we’re in the era of mobile, but in a rare move, Google pre-announced the update, telling us that mobile rankings would differ for mobile-friendly sites starting April 21st. With all the fuss about Mobilegeddon, in the end, the impact of this update was much smaller than expected. A lesser-known change came on June 26th, when Google rolled out carousel search results for mobile searches. The new search results pull images from sites like Pinterest, Houzz, Food Network, etc. making it even easier for users to find what they are looking for. Now, people can easily swipe left or right to see stuff that are most relevant to their queries. The long and short of this update is answering people’s demand for more imagery. Therefore, businesses who are NOT utilizing platforms like Pinterest & Houzz, the digital marketing landscape just got much more competitive and here’s why. Like the old saying goes, a picture is worth a thousand words. These words could never ring more true than in today’s digital world. Humans are visual creatures by nature. In fact, about 65% of the general public are visual learners, meaning we learn best through pictures, charts, diagrams, and colors. It makes sense that people are now flooding to sites like Pinterest and Houzz. For example, Houzz has 40 million active users, and 25 million unique monthly visitors. 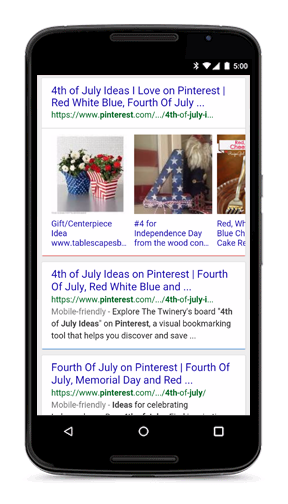 Google mobile search carousel allows users to view more visual results so it’s easier for us to find that perfect decorative pillow or reputable home remodel company we’ve been looking for. How do you turn these virtual window shoppers into leads though? There’s several steps you should follow when creating your business’ Pinterest and Houzz profiles to ensure your getting the most out of each platform. Pinterest may be the simplest account to set up. You can easily make a profile full of stunning images and relevant pins for your target market. For your change to be showcased on the carousel your pins need to be powerful and optimized. How do you do you optimize your pins? You can’t have good-looking pins without a good-looking profile. Next, make your boards remarkable! Create a board for each of your topics or ideas so users can quickly find relevant boards. Now, add enticing pictures people can pin and save. Know the best dimensions for your pin. The platform advises a minimum of 2:3 ratio and a maximum of 1:3.5, so roughly 736pw wide by 1104px – 2576px tall. Unlike Twitter you have a 500-word limit to explaining your pin. This is a perfect spot to insert keywords if it makes sense. Add extra details to your Pins to make them more useful. For example, a Product Rich Pin makes it easy for people to buy your stuff by including real time pricing, availability, and where to buy. You’ll want to remember that SEO efforts take time. Most likely you won’t see results over night, or even in a month or two. However, if you implemented your strategy right you should see big improvements by the third and fourth month. The more people interacting with your Pins, the more likely your images will be showcased on the carousel. If you haven’t been to Houzz yet, you’re missing out. Houzz is heaven for anyone remotely interested in home remodeling and decorating and a HUGE opportunity for businesses in those industries. You can discover design ideas, shop for your home, and connect with local professionals to create the home you’ve always wanted. Fair warning though – it can become an obsession. But, did you know that it’s a great marketing tool as well? Houzz positions itself as a “leading platform for home remodeling and design providing people with everything they need to improve their homes from start to finish.” It’s a combination of several things; it’s a social media network, an inspirational search engine, a business directory, digital scrapbook and a tool to collaborate with clients. For businesses in these industries, Houzz is a new way to capture their target demographic. Currently, there are 40 million users on Houzz and 1.5 million local professionals. Most users are homeowners (90%) interested in home improvement projects within the next 2 years (Source). Architects, interior designers, furniture designers and other professional can create a Pro Profile for free. Add a business description that links to your website, Facebook, Twitter, Google+, and your blog. Show off all the projects you have recently completed. Projects should be organized by client, job site, or product line. Visitors to your page can share photos from your ideabooks – the more ideabooks your photos are shared in the better. Houzz is truly about communicating with the home improvement community – make sure you respond to questions they may have about your photos or ideabooks. Social proof is one of the most influential deciding factors for prospective clients. When it comes to Pinterest and Houzz, site participation and growing your followers are all contributing factors to being more prominently displayed on each site and in Google’s mobile carousel. Keep in mind that SEO is time-consuming and you can’t expect changes overnight. However, a strong SEO strategy is essential for success in today’s digital landscape. If you’re not currently participating in these practices, there is no better time than now to begin. If you’d like to learn more about SEO strategies for your business, drop us a line. We’re always happy to talk about digital marketing and how your business can benefit from it.